1 What is a Cloning Machine and Why Do You Need One? What is a Cloning Machine and Why Do You Need One? A plant cloning machine makes the process of cloning your plants easier. They’re plastic square or circular boxes that hold a pump, nutrient mixture, and aeroponic spray nozzles. In many ways, they’re just another type of hydroponic system. On the top of the plant cloner, there are a bunch of circular holes that are filled with soft or hard neoprene inserts. These are the cloning sites, and how many your machine has will depend on your needs as a gardener. When you take a cutting of your plants, you place them into these cloning sites and turn on the water pump. The pump will then force the nutrient mixture through the spray nozzles, covering your cuttings in a highly-oxygenated mist. While you can clone plants without an aeroponic or hydroponic cloning machine, the process usually takes at least twice as long. You also have to pay much more attention to your cuttings during the rooting phase if you’re not using one of these systems, because the environment they’ll be in is much more finicky. Before we get into the top cloning machines, let’s take a quick look at how you go about taking cuttings and cloning them in systems like these. First, fill up your cloning machine with water and attach your mister and pump. Run it to make sure the misters are covering the entire surface area of the lid. You can add a light nutrient mixture at this point, but it’s not necessary — remember, your cuttings do not have any roots. Fill the machine to the indicated level with water that is at 65-68°F (18-20°C). You don’t need to use a humidity dome if you don’t want to, but most of the recommended cloners will come with one anyways. If the humidity in your cloning area is under 60%, you should either mist or add the humidity dome. Keep your temperature between 700-75°F for optimal results. You may also want to keep track of your nutrient solution. Ideally, you want it at 68°F (20°C), which is pretty easy to maintain. Just make sure your pump isn’t heating up your reservoir too much. As far as light goes — your cuttings don’t need much. All you really need are some T5 grow lights at about 1’ away from the canopy. I will leave the process of how to take a plant cutting to another article, so if you don’t know how to do that, stay tuned. But if you do, just start taking cuttings and inserting them into the neoprene discs that will come with your cloning machine. You want about 2” of the stem to be below the bottom of the neoprene insert so that the mister can hit enough of the surface. Early on, it’s OK if your plants look a bit droopy. They’re just getting used to being rootless, and should pick back up in a few hours. If they continue to look wilted after the first few hours, you should mist them with a foliar spray to help them out a bit. After about two days, you’ll start to see roots develop. When you see this, make sure they’re bright white — the classic sign of healthy roots. If they’re grey or brown, it may be a sign that your water temperature is too high. You can also consider a full reservoir reset once rooting begins. After about ten days, you should see the secondary roots popping out of your cuttings and you’ll know this is time for them to be transplanted. From here, you can do whatever you want — put them in the ground, transplant them into your deep water culture system, or whatever else your green thumb desires. What surprised me when shopping for cloners was the vast differences in price between different brands for what appears to be more or less the same thing. After using a few, I realized that sometimes the price difference is totally justified…and sometimes it makes no sense at all. Here’s a case where the price is justified. The best cloner you can buy is the TurboKlone system. It’s built from better materials than most cloners and the design is robust. It comes with a submersible pump, manifold, and spray nozzles. But on top of those, the Turbo Klone also comes with a fan. It attaches to the reservoir and is used this to keep the reservoir cool, which is an awesome feature. High reservoir temperatures are often a reason that gardeners fail at cloning. Verdict: If you can spend the money, go with the TurboKlone. After testing a few, I believe the cloners by Clone King are the best value for your money. They come in two sizes: one with 25-sites, and one with 36-sites. Either is more than enough for most indoor gardeners. They come with a water pump, 13 misters, the lid, and the neoprene inserts, so they’re as close to a plug and play cloning solution as you’ll find. I have gotten nearly 100% success rates with these cloners for the entire time I’ve used them, which is more than I can say of other systems. Verdict: If you’re looking for a budget cloner, go with the Clone King models. I tested two other cloners: the ones from EZ Clone, and the Clone Bucket. Let’s start with the Clone Bucket. In my opinion, if you’re going to buy a Clone Bucket you may as well just build one yourself. It’s a simple 5-gallon bucket design with holes drilled in it, bundled up with a pump and some other accessories. You may as well just DIY it instead so you can customize the lid to your specific needs. Now, the EZ Clone systems. These are by far the most expensive ones on the market, and I can’t seem to understand why. They’re not very well reviewed, and seem to offer no more than the Turbo Klone systems, but at a much higher price. If you have an affinity for the brand and want to use them, by all means go for it — but I don’t recommend them. Lastly, there are a few accessories you may want to pick up to make the cloning process easier. By far, the most essential of these are Clonex or Clonex Mist. 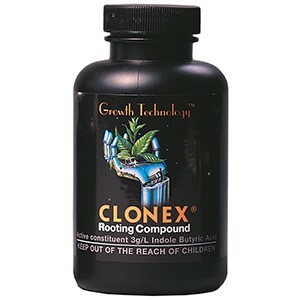 This is the industry-standard rooting hormone that can drastically speed up the process of your cuttings setting out roots. Next, Clear Rez will keep your reservoir nice and clear so your roots are in optimal health. Finally, you may want to pick up some extra misters and neoprene collars. You can get the collars hard or soft, all depending on your preference and system. I use a platinum 30 cloner and have had great success trades, now it’s winter and I’m noticing my clones are for 1 taking longer and 2 I’m noticing that my stems are starting to go slimy almost mouldy ,my reservoir temp is 24 degrees celsius and just read that ideal temp 18-20c. On your page could this be why I’m having these issues ,also are our machines suppose to be constantly running. Hmmm…it’s gotta be an issue with either light leakage creating algae, or disease is your system, or an environmental change as winter set in. I’d check your cloner for those issues, in that order, and report back! Can hard wood cuttings be done in a clone machine. Or better yet, what can’t be done in a clone machine. I think they’d be harder to do, no pun intended. Constant moisture on hardwood cuttings might cause them to rot out or get molded. I have yet to experiment with clone machines and hardwood cuttings, though. Hey Albert – Basil is a notoriously fast-rooting plant, so you don’t NEED rooting hormone for it. I still use it though because it’s easy and I’m usually rooting other plants while I make my basil cuttings anyways. Exactly correct on EZ clone! We started with them about 10 years ago & they were just starting, so they were hungry! (Good price, decent value) Then, after a modicum of success, they just went open loop on useless bells & whistles and Then JACKED UP the F’ing price! You are right to advise everyone Not to buy from these assholes! Yeah, not sure why they went that route. I go DIY or I get one of the ones I recommend when setting up system for friends or expanding my own.